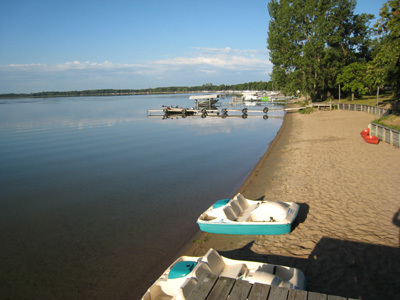 We’re proud to be a modern, family-oriented resort offering everyday people the opportunity to escape to paradise on Blanche Lake in Otter Tail County, Minnesota. 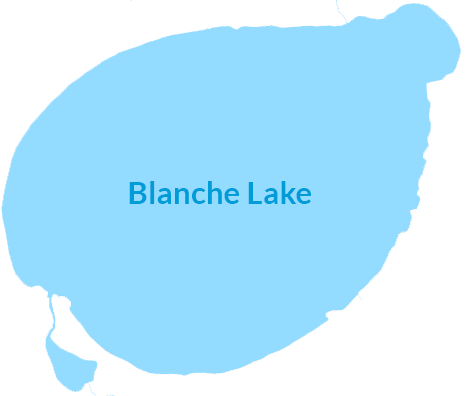 Blanche Lake is a beautiful oval lake with 1,268 acres of crystal clear water and sand bottom. 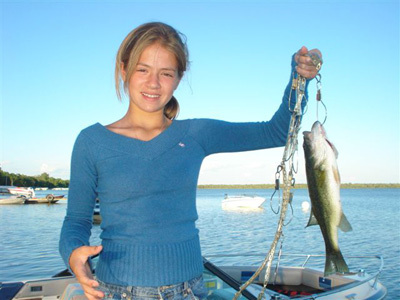 Well-stocked with a variety of fish – walleyes, northerns, crappies, bass and bluegills – it is a favorite for many fishermen. Blanche, half surrounded by Minnesota’s newest state park, Glendalough, is protected in a pristine setting for all to share. With 15 comfortable housekeeping cabins situated on a beautiful relaxing setting that includes 10 acres of spacious, wooded grounds and nearly 400 feet of safe, sandy beach, our accommodations fill up quickly. 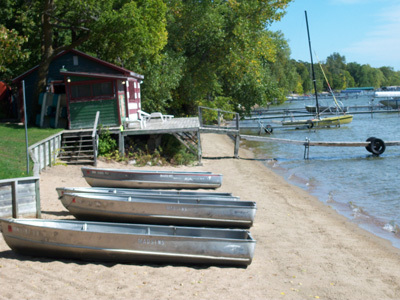 Madsen’s Resort is the ideal place to partake in your favorite water sport, fish or relax with family and friends. 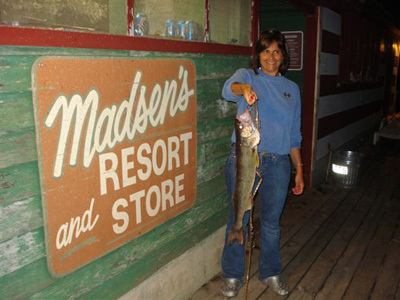 With something for everyone, Madsen’s is the resort for you! Our little store is well stocked with groceries, bread, milk, beer, pop and ice, as well as souvenirs including caps, T-shirts and sweatshirts. For anyone who needs to stay connected, we also have Wi-Fi available. On days when it’s raining or you just need a break from all that sunshine, head over to our rec room, which is adjacent to the store. 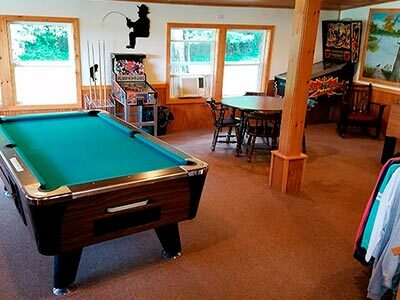 Entertainment includes a pool table, pinball games, foosball and video games. Because we’re committed to your comfort, our furnished cabins are complete with a full kitchen, coffee maker, microwave, cable TV, linens and blankets, and hot showers. We do not provide them, so be sure to BRING YOUR OWN TOWELS! All of our units are housekeeping cabins, meaning we provide the cleaning supplies and trust you to maintain the cabin during your stay. This helps us keep our costs down and allows you more privacy during your visit. While you’re here, you’ll also have full use of a 14-foot aluminum fishing boat with life jackets and dock space, a Weber BBQ grill, picnic table, beach and lawn chairs, and unlimited use of kayaks and canoes. Learn more about what Madsen’s has to offer and what to expect during your stay. From boat, motor and pontoon rentals to live bait sales, we have everything you need to make your vacation complete. 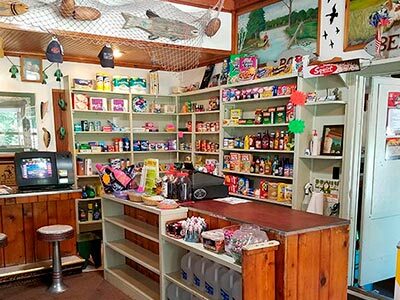 Our fully-stocked convenience store carries groceries, pop and beer, and has Wi-Fi to keep you connected! Adjacent to the store is Madsen’s rec room, featuring a pool table, pinball, foosball and video games. 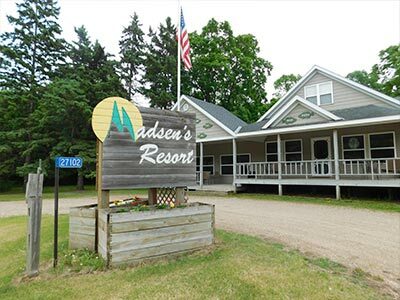 With so much to do right at the resort, you won’t have to leave Madsen’s until your vacation is over. However, we fully understand that our area of the state has so much to offer visitors. From sightseeing to history museums, and from fine dining to shopping, you’ll be within easy driving distance of it all. Still not convinced Madsen’s Resort is for you? Check out our gallery of photos from recent guests. The scenery is sure to hook you, and the smiles are guaranteed to reel you in! Enjoy the cooler weather and a little more peace and quiet during the spring and fall seasons. From May 11th to June 15th and from August 17th to October 1st, we offer guests discounted rates! (2-day minimum) Learn more on our Cabins & Rates page. When you reserve a cabin from August 24th – August 31st, stay until Monday, September 2nd, at no extra charge! (9 nights). For reservations longer than one-week, from June 15th thru August 17th, deduct $50 off the standard rate for the second week, and $75 off for the third week! $50 off the standard rate for the second week, and $75 off for the third week! Stay one full week from June through August and receive a 50% discount on our Mid-Summer rates during your fall visit! (2-day minimum).